Hot off the assembly line and into the studio. 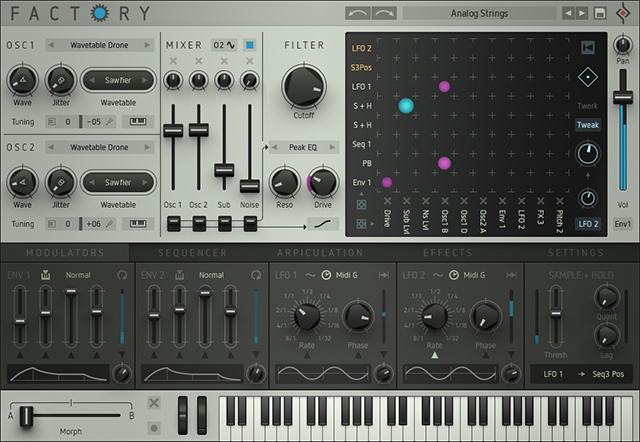 Factory is the new modular influenced poly-synth from Sugar Bytes that features some serious sound creation and morphing possibilities. Sugar Bytes has been a big player in the music scene known for their arsenal of unique plugins like Cyclop, Turnado, Effectrix, the famous WOW Filter, and many other audio software tools. Thier latest achievement brings a new twist on modular synthesis and sound shaping possibilities – Meet the new poly-synth called Factory. Factory is a completely programmable polyphonic modular synthesizer that provides unlimited connectivity between all its modules to provide some incredible modulation possibilities for creating professional quality sounds. Factory streamlines the well-known concept of a modulation matrix and employs an interconnection system as a key element that combines maximum routing flexibility with playful and intuitive access. Capable of creating any imaginable sound, Factory features various oscillators, filters, effects modules, a step sequencer, an arpeggiator, extremely powerful modulation options for controlling almost every parameter, and a Modulation Matrix to tie everything together. This includes envelopes, LFOs, the arpeggiator, and even the four-track step sequencer. Finding the perfect sound for any genre couldn’t be easier thanks to Factory’s innovative and clearly structured preset browser. In addition, Factory works flawlessly as a plugin for all common DAW hosts or as stand-alone application on Mac and Windows PCs. Factory’s sound generation is driven by two oscillators that feature ten synthesis models each, one sub-oscillator, and a noise oscillator. The signal source can be combined and ring-modulated if desired, shaped further by a multimode filter and/or a drive section, processed with an effects section loaded with three multi-effects modules running in series, and brought to life through a central modulation matrix. In addition, Factory features two envelopes, two LFOs, a sample + hold module, a four-track step sequencer, and a arpeggiator. Finally, give your sounds some expression with the clever Morph fader and the “Intonation” feature that creates a bit of animation and randomness heard from many vintage synthesizers. The two main oscillators are Factory’s main signal sources. They both offer ten different oscillator models each, giving you a variety of sonic capabilities for creating some serious sounds. Choose between Pulse Sync, Saw Sync, Saw Fractal, FM Formant, Transformer, Wavetable PWM, Wavetable Sync, Wavetable Formant, Wavetable Drone, and Waveguide. After selecting an oscillator model, dial in the sound further using the different set of sound shaping controls available for each model as well as the Tuning and Pitch Track functions. A unique model worth spotlighting is Transformer, which is a granular oscillator that allows you to import an audio sample of your choice as the sound source. The sample is automatically analyzed and transformed into a wavetable which is then played back in segments as a looped waveform. The Mixer section in Factory is where sound sources are combined for further treatment. This section provides options to add a sub oscillator and a noise source as well as routing options to send the signal through the filter and drive sections. There is also the option to ring-modulate both oscillator signals together for even more sound manipulation possibilities. The Mixer features knobs and faders. The knobs can be controlled via the modulation matrix and are used for level modulation. The subsequent faders are used to control the level ratios between the different signals. Factory’s Filter section offers an excellent sounding multimode filter that features eleven sound-shaping options. The different filter types are LP 2 Pole, LP 4 Pole, LP 8 Pole, LP / HP, Midboost, Bandreject, Bandpass, Highpass, Peak EQ, Comb, and Vowel. The Drive section provides three types of distortion effects. Choose between Tube, Diode, and Sine in conjunction with the different filter types and their settings to generate subtle or very intense and dynamic sounds. Using the routing switches on the Mixer, try using different signal path routings to achieve different results. For example try placing the filter before distortion in the signal chain or vice versa to produce significantly different sound treatments. Tailor the sound character further using the Filter Smooth and Expensive Drive to controls to reach a desired sound. The Mod Matrix is Factory’s standout feature and is where the magic happens. It is flexible polyphonic patching system that is capable of routing up to eight modulation sources at a time to a maximum of ten target destinations. Each of the eight modulation sources has a drop-down menu to choose between 18 different sources while each of the ten target has 34 destinations to select from the menu. The Mod Matrix is equipped with a wealth of sound timbral manipulation options that at first may seem daunting. However, the fastest way to explore the creative possibilities is clicking on the dice symbol underneath the sources section to generate random modulation configurations sure to get you sailing. To connect a source to a destination, simply place your mouse at their point of intersection in the matrix grid and then move the mouse up or down to create a colored circle. A blue circle represents a positive value and purple a negative value. The modulation depth is visually represented by the size of the circle. The fun doesn’t stop there; the Tweak knob on the right of the matrix provides an interesting function that enables the chosen modifier to alter the modulation depths of all active mod paths at the same time. Try using either the Tweak, Mutate or Target modes to produce different results. The Mod Matrix also extends an addition level of complexity for those looking to go even deeper into modulation possibilities. Check out a few advanced features in this video. The Modulators tab in Factory is where sounds are brought to life. 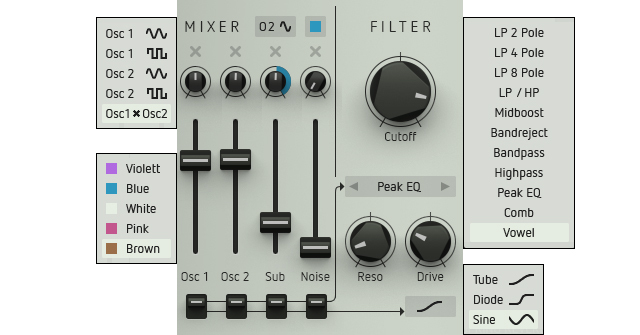 This section provides two identical ADSR envelopes, two identical LFO’s, and a Sample and Hold module. Factory’s Envelope Generators are essential ADSR envelopes that allow you to control the shape and duration of sounds. This section also provides three envelope functions: The Loop function is used to generate complex periodic modulation shapes. Velocity sets the maximum envelope level that will be determined by velocity. Trigger Source is a fun function that gives you the ability to select a trigger source such as a MIDI note-on command, sequencer steps, arpeggiator steps, or LFO to produce rhythmic modulation. In addition, all five envelope parameters mentioned can be modulated by the Mod Matrix. The two identical LFO’s provide periodic modulation. Rate, Waveshape, and Phase are the main parameters that can be controlled by the Mod Matrix while the Retrigger, One Shot, Mono/Poly LFO, and MIDI Sync parameters are used to define the behavior of the LFO further. Factory’s Sample and Hold module is an advanced function that generates complex modulation waveshapes with trigger sources to create some impressive rhythmical effects. This section features 19 Trigger Signals and 24 Sample Sources that can be controlled further with the Threshold, Quantizer, and Lag parameters. Factory also features a step sequencer that displays four tracks of up to 16 steps each. Draw pitch values directly into the track window or select one of the 36 different curves to build complex or interesting sequences. The sequencer can also be used to control up to 35 sound parameters via the Mod Matrix or used to trigger the envelopes, LFO’s, Sample and Hold, and Arpeggiator steps. This section features an arpeggiator, a Pitch Factory section with several global functions to control pitch, glide, and unison, and an Intonation section that provides envelopes used to create subtle inaccuracies that emulate the authentic tone of acoustic instruments and vintage synthesizers, as well as produce pitch-changes similar to a sitar or slide guitar. Put the final treatment on your sounds with Factory’s built-in effect section that features three identical effect slots connected in series each sporting a selection of 13 sound sweetening options. Select between Groove Delay, Pitch Delay, Reverse Delay, Corpus, Pianoverb, Shimmer, Spring Reverb, Whiteverb, Equalizer, Stereo Filter, Dynamic Filter, Chorus, Phaser, Flanger, Shatter, Lofizer, and Compmax. You can also swap the order of effects and modulate most of the parameters using the Mod Matrix to create more unique sounds. Imagine delay patterns controlled by the sequencer or a filter effect controlled by keyboard pressure. In addition to the keyboard, Factory also sports a pitch bender, a modwheel for add some major expression to your sounds, and a Morph fader to perform complex timbre changes with a single fader movement. Tip: The Morph fader can be assigned to a MIDI controller for some fun morphing action. Check out some cool morphing possibilities in this video. Available to download at Sugar Bytes and authorized Sugar Bytes dealers.